Value of card: "When I was your age, a pack of baseball cards cost a nickel." 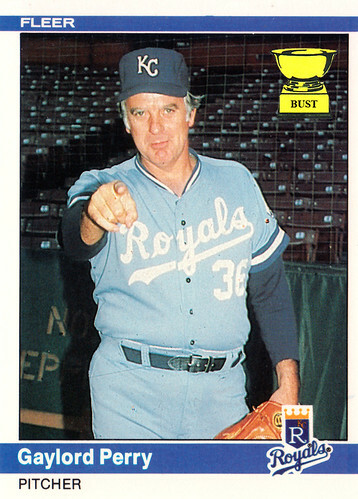 What's Gaylord Perry pointing at? (A) One of 721 big-league players younger than him. (B) A photographer who could have worked a bit harder for a better shot. (C) A producer of "Major League" looking to research the role of Eddie Harris. (D) Some chump reading a mediocre sports card blog.